Snapshot of Korean miso stew made with enoki mushrooms and green pea shoots on August 3, 2016. 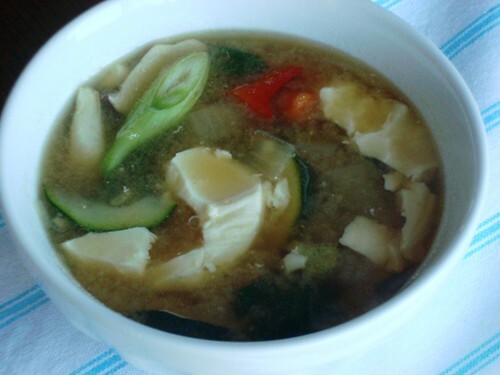 Once you are comfortable with miso, you should feel free to include any vegetables you like. 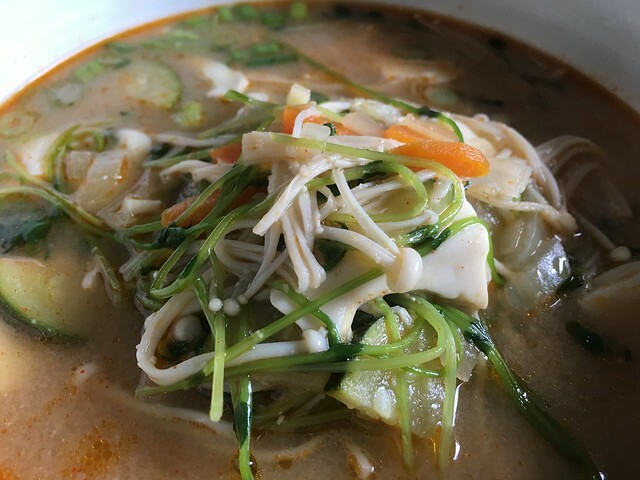 Every once in a while, I feel the need for some authentic Soon Doo Boo JiGae, a hearty, miso-based stew that's chock full of fresh vegetables and silky soft tofu. If you grew up in a Korean home or have had the pleasure of trying Soon Doo Boo Jigae at a Korean restaurant, you probably know exactly what I'm talking about - it's a need that cannot be defined. Welcome to a step by step look at how my mom makes her version of Soon Doo Boo Jigae - in case you're wondering, Soon Doo Boo means "soft tofu," and Jigae means "stew." 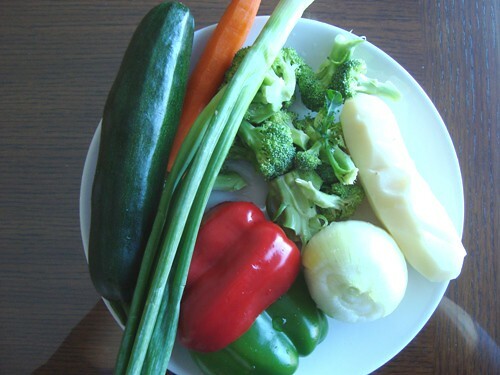 First, you need a bunch of fresh vegetables. 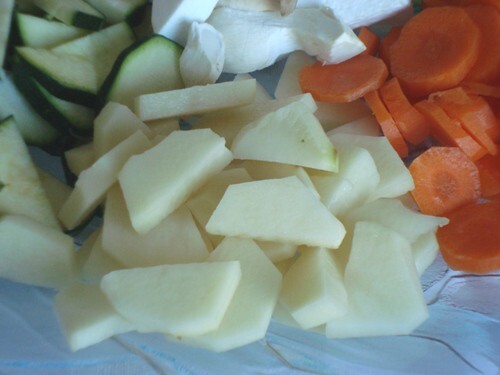 Chop your vegetables into bite-size pieces. 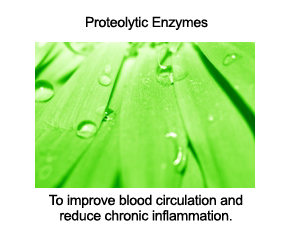 Let's take a closer look at our ingredients. You have one small to medium zucchini. One small to medium yellow or white flesh potato - whichever you prefer will do. One small carrot and a good handful of oyster mushrooms. 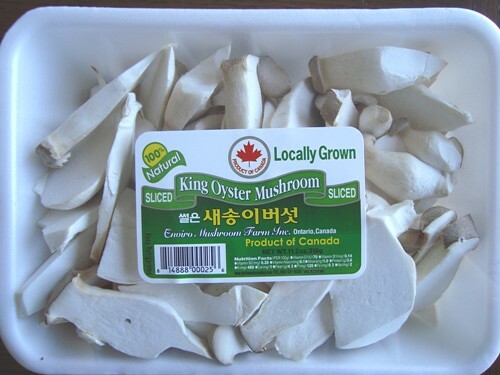 We usually get our oyster mushrooms at a Korean market - they come sliced and ready to cook. 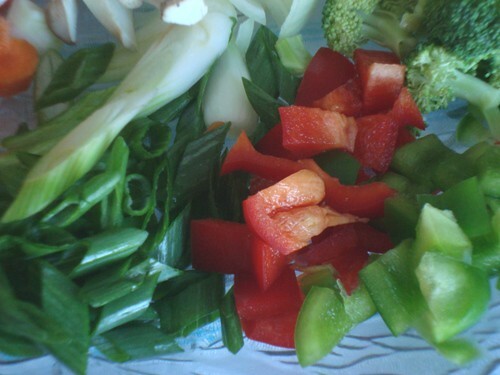 One spring onion and about half a red bell pepper and half a green bell pepper. A good handful of broccoli plus one small to medium yellow onion. Notice the little spout on the end? You cut that open with a pair of scissors and squeeze the tofu out. If you can't find this type of tofu, it's fine to use the softest tofu that's available at your local grocery store. Now here's what I consider to be the key to making any miso-based soup or stew that people will remember you for: Start with vegetable broth. 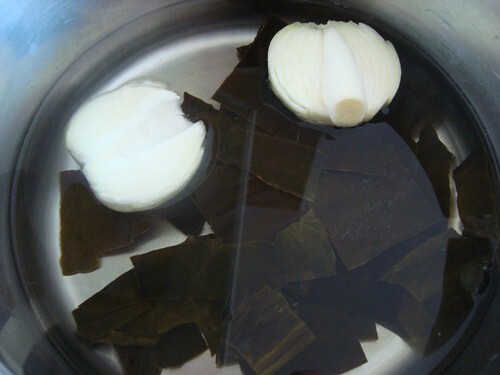 My mom makes a quick, flavorful broth with 5 to 6 cups of pure water, one onion, peeled and halved, and a generous handful of dried seaweed. 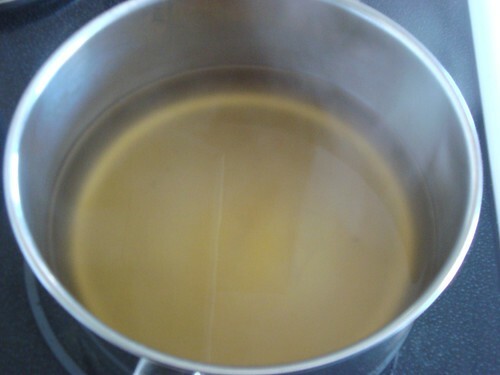 If you don't have time to make this broth or you just can't find seaweed, you can't go wrong by using your own vegetable broth. Just try to stay away from store-bought varieties, as you don't want the broth to be salted, since you'll be adding miso, which provides all the salt that this recipe calls for. Start with a package of Da Shi Ma, also known as firm, dried seaweed. Each square is quite hard - you don't want to use a softer variety of dried seaweed that would easily crumble in boiling water. 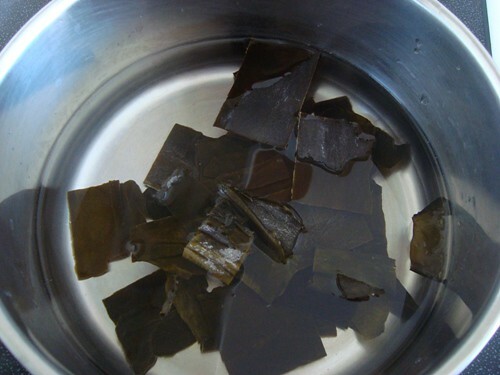 You want this seaweed to stay intact while the broth boils - it's used only to impart minerals and flavor. A generous handful of Da Shi Ma in about 5 cups of water. Plus one yellow onion, halved. 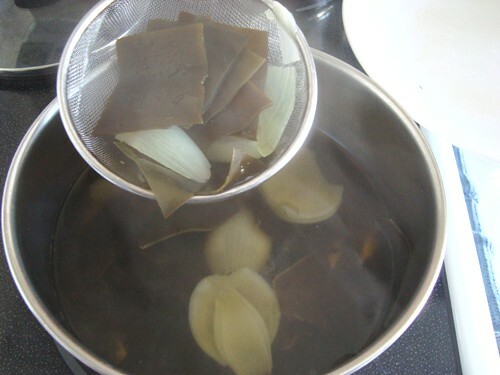 After boiling for about 15 to 20 minutes, use a good strainer to fish the seaweed and onion out of the broth. You're left with a lovely golden broth that provides a layer of flavor to the stew, as well as easy-to-absorb minerals like calcium and magnesium to help you maintain healthy bones and teeth. Sorry about the slight haze in these photos - the broth was boiling away and I wasn't able to capture things without a bit of steam in the air. 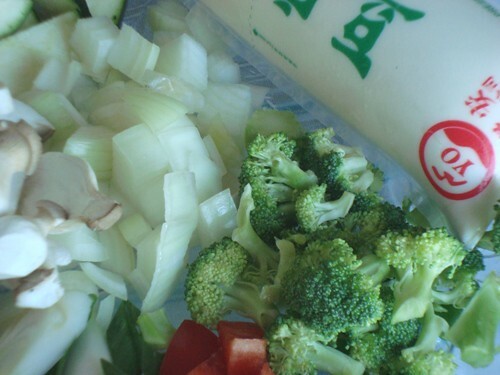 Now start adding all your vegetables to the broth. 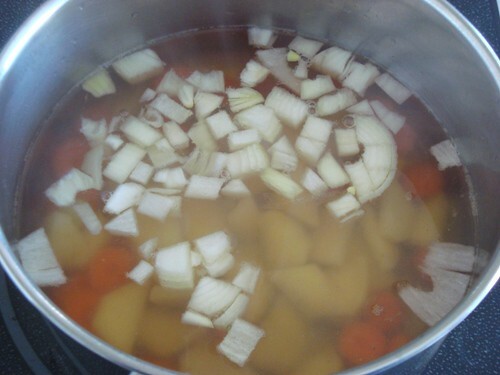 You can begin with the potatoes, carrots, and onions. Let these little guys boil on low to medium heat for a good ten minutes, or until the potatoes and carrots are slightly tender. 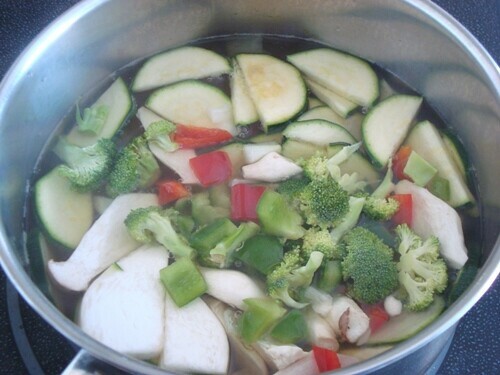 Now add the zucchini, broccoli, red and green bell peppers, and mushrooms to the mix - let things boil on for another 5 minutes or until the zucchini is tender. 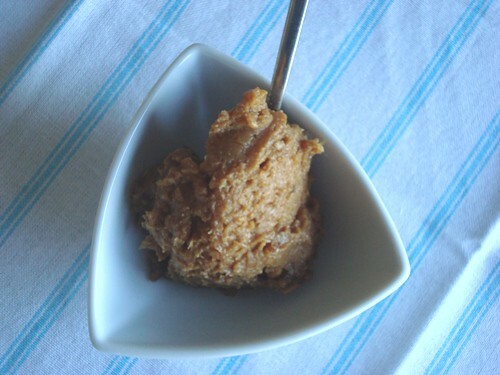 For about 5 cups of water, you'll need a heaping tablespoon of miso, which is about two and a half flat tablespoons. But it's best to start with a little less and taste as you go because you can always add more if you need to, and you don't want the stew to get too salty. Though you should know that soon doo boo jigae, by nature, is a bit of a salty stew that is balanced out with a bowl of steamed rice - one spoonful of hearty stew for every spoonful of perfectly steamed rice is a good way to enjoy it. Add the miso and stir for a bit until it dissolves. 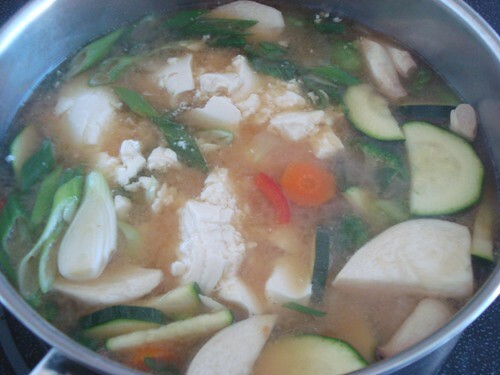 You may need to press some of the miso up against the sides of the pot to help it dissolve. Now add the soft tofu and green onions - it's about 2 cups of soft tofu, roughly broken apart into spoon-sized clouds of tofu as it's transferred to the stew. Give everything a good stir or two to warm the tofu and green onions, and it's ready to eat. Here's roughly what a bowl of soon doo boo jigae should look like right before you start devouring it. Don't forget to enjoy it with steamed rice or some other food group that helps balance out the richness of this stew. 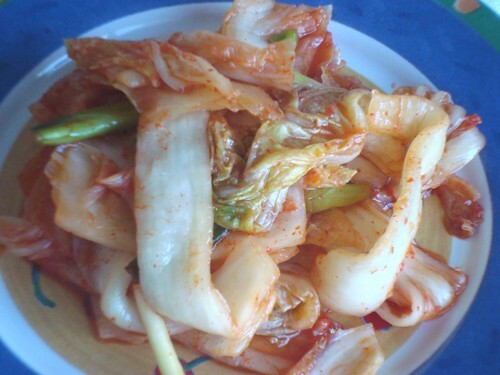 Click here to see how to make cabbage kim chi. 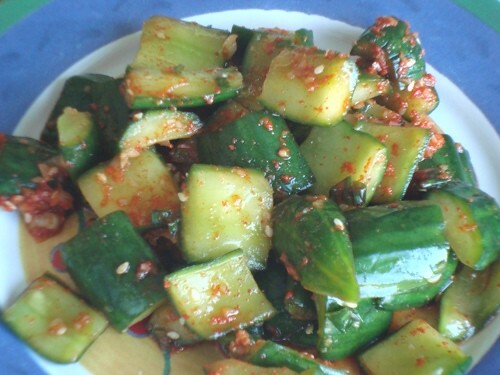 Click here to see how to make cucumber kim chi. 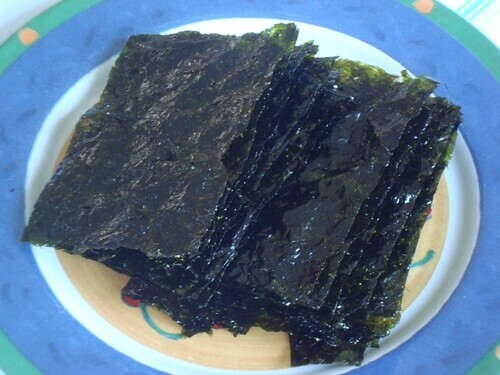 Dried Seaweed - this is a thinner variety of seaweed, the kind used to make sushi rolls. This dried seaweed is seasoned with a tiny bit of sesame oil and sea salt and toasted for just a few seconds on both sides before being chopped up into these easy-to-eat rectangles. 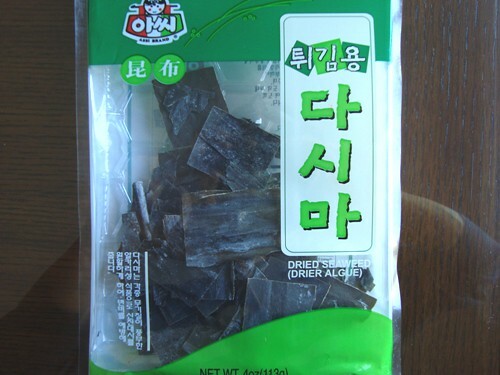 You can buy pre-toasted and seasoned dried seaweed (called Geem) at any Korean market. 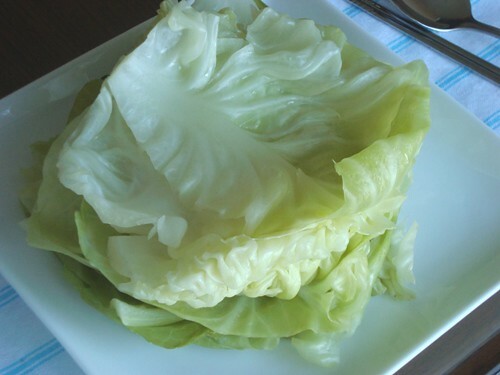 Steamed Green Cabbage Leaves - nice and sweet, perfect for making wraps out of rice and a mixture of miso and gochujang (a Korean chili paste). 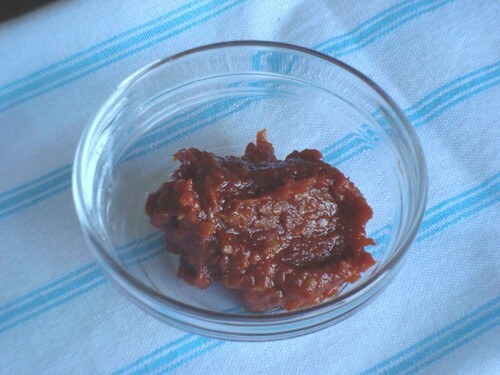 And here's the miso and gochujang mixture mentioned above. Finally, a lovely dish of seasoned and mildly spicy green beans. Here's a look at everything together minus the steamed rice, which you want to get nice and hot out of the rice cooker just before eating. 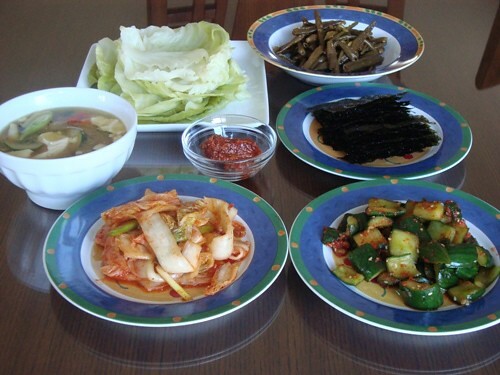 The next chance I get, I'll ask my mom to show us how she makes each of the side dishes shown above. We do have a few of them in our recipes archive, but I think it really helps to have pictures that show each step in making them. Hope this pictorial inspires you to master the art of making soon doo boo jigae. If you have any questions or comments, please use the "add new comment" section below. Thank you for the "Soon Doo Boo JiGae" recipe. It really helps to have pictures that show each step in making them. 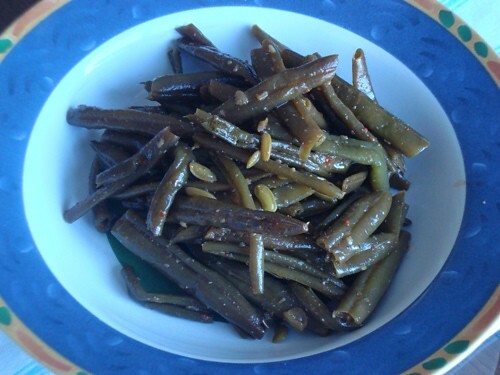 I am looking forward to having your recipes on Dill Pickle Kim Chi (fermented spicy cucumbers) and the dish of seasoned and mildly spicy green beans. what a beautiful way to share a recipe! Please give your mother thanks from us. We'd love to see more of her recipes in the future. Ditto!!! Plus it's a much more interesting Soondooboo recipe than I remember in Korea! Thank you for sharing. Being an artist, I love having the pictures. I can't wait to make this recipe! Thank you for all your hard work in sharing your health tips and recipes. Thanks for sharing your family recipes with us. We LOVE new soups and plan to try a pot right away. I'm very interested in the dill pickle kim chi recipe and the green beans too! I love, love, love your photographed recipes and how you don't leave out the minor details. It's really helpful for someone of a different ethnicity or a brand new cook like myself to understand just what I should do. I love Korean food and was very excited to read this post. Can't wait to try it out myself. 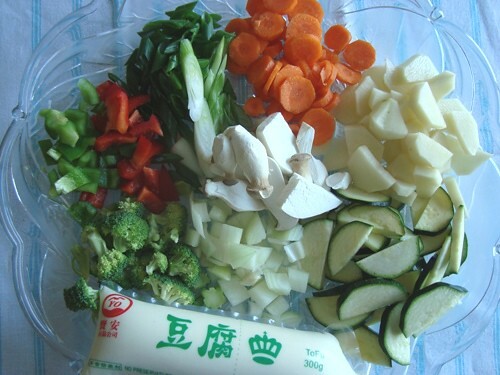 Just one question, the miso paste that you mentioned above, is it the same as "deng jiang"? Also, many times when I visit a Korean restaurant, they give you an egg custard dish that comes in a small casserole bowl. The texture is extremely tender with a sprinkle of sesame oil and green onions on top. Because I enjoy this side dish very much I bought a small casserole from local Korean supermarket, but my eggs turns out to be either undercooked or overcooked with each of my failed attempts. If you have any clue of what I'm talking about, can you please show us how I can master this simple dish using the casserole bowl? Thanks. Well thank you for that and now I am starving to death and am almost drooling!!! I love the pictures you have been adding...Yes they help. Especially with recipes including products that I have not used before. Or have but not to any extreme. And I love your added enthusiasm when you are leaving the recipe. It is wonderful and refreshing. It makes me smile. This is very useful for shopping at the Korean market. Our dog's groomer is Korean and has shared some foods with my daughter who sometimes helps her out. We love Korean foods but when we go to the market we cannot read most of the products or know how to use them! Please keep these useful articles and recipes coming, and you are helping us non-Koreans out a LOT! I plan to print your mom's recipe and take it to the Korean market with me (we have Zion market here in San Diego). I was just there and really need this, so Thank You Very Much!!! Amazing idea - this pictorial definitely inspires me to master the art of making soon doo boo jigae. I am always impressed by your articles, Dr. Ben Kim. dear dr kim your recipe for the miso stew was awesome! 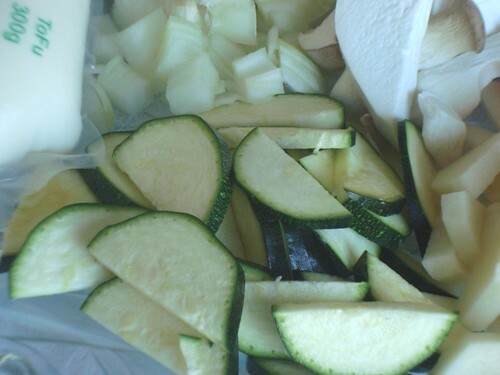 !it was delicious and very easy to prepare.i made it 2 times in abuot 10 days and ate it all! 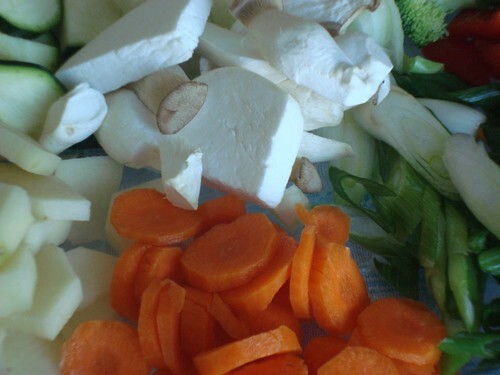 !please share more healthy recipes soon,especially the side dishes served with the stew.any thoughts or comments on raw food diets?this is what i try to follow.thank you so much-love your newsletter!! 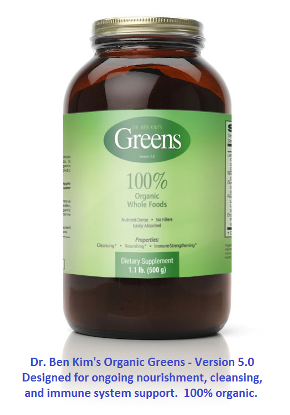 A quick question about unfermented soy. 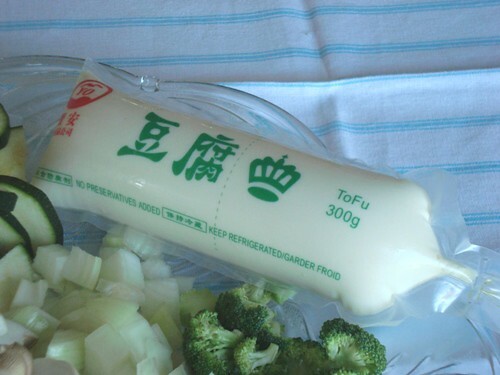 I've always loved tofu & eaten it & drank soy milk over the years. Recently I've read in a few places that unless it's fermented (tempeh or miso) it can have negative effects for your health. The reason given is that it is estrogenic. Do you have an opinion on this? Thanks for your recipes - we prepare greens your way a few times a week now and love them....... Next up to incorporate - almond milk & smoothies. Wow! I thought the stew with rice made a meal. I'm jealous--can I borrow your Mom??? Thanks for the authentic recipes! The pictures and the detailed instructions are great. There is Kim Chi in my future. 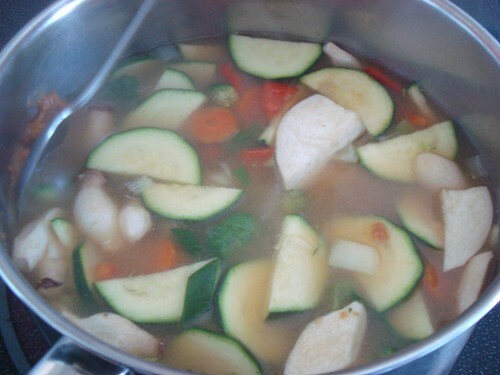 The miso stew is very similar to something I often fix as a quick lunch soup during garden season. No potatoes, firmer cubed tofu, and rice vermicelli added at the end. 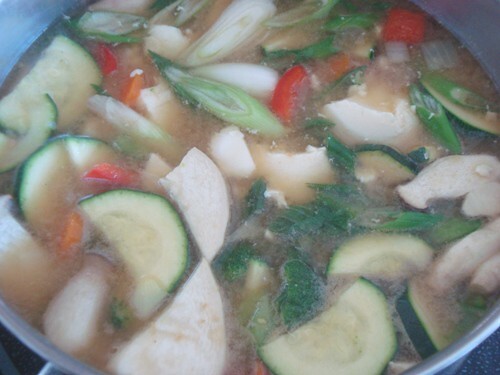 We just call it tofu-miso-veg soup. I am allergic to tofu, what can Isubstitu that with? Is there anything else I can use instead of miso? I would like to make the stew. Loved the step-by-step recipe and coordinating pictures! 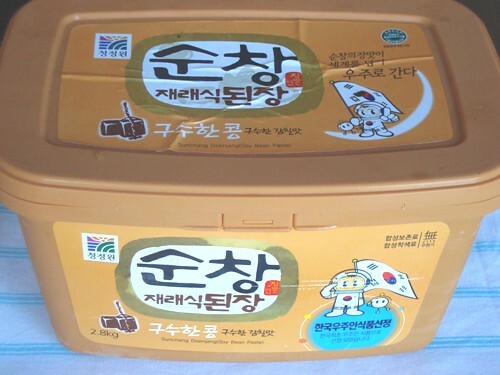 Just a head's up, this is not soon doo boo jigae; this is doenjang jigae. I am working on 8th Ave in Brooklyn i will definitely pickup the ingredients Thank you for sharing.